New Balance 1400 v6 are neutral racing running shoes. Following its annual appointment the racing flat New Balance 1400 v6 is already available for all fans of one of the most valued saga among those who run fast. 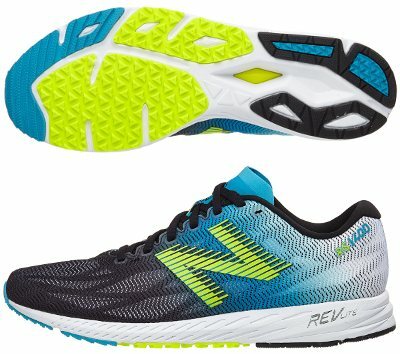 Everyone in the american brand is really happy with performance from REVLite platform (used as well in its counterpart with limited pronation control 1500 v4) but this feeling changes when talking about the upper, which has been completely revamped in current sixth edition so it is easier to justify price update (aka increase). 10 mm drop and superb response remain untouched. As mentioned above, new upper is the major (almost the only one) change compared to its predecessor 1400 v5. Mesh is no longer made of knit-like fabric (like FlyKnit from Nike or PrimeKnit from Adidas, huge trend in 2017) but of multilayer configuration where external one is extremely breathable and makes visible a light but solid structure made of FantomFit that keeps everything in place featuring snug and secure fit. Tongue has been upgraded as well inspired by track spikes to make sockless running more comfortable. Oversized "N" logo from New Balance on both sides keeps motion blur to increase speed effect, a cool distinctive for "Racing" lineup. There is no change in midsole and outsole, even 10 mm drop remains the same. Cushioning relies on full length of light and responsive REVlite (Fresh Foam fans should check Fresh Foam Zante v4). Outsole keeps aggresive lugs in forefoot (already premiered in radical racing flat Hanzo) for great traction to promote quicker toe-off so do not expect long durability.